Follow Michael Matters on twitter.com! The Office of Disciplinary Counsel and the Judicial Conduct Commission process incoming complaints, manage the schedule for panel hearings, issue notices, and track responses to each complaint. To aid your organization, we provide commercial-off-the-shelf case management solutions customized specifically for Lawyer and Judge Disciplinary Counsel. Michael Matters supports a customized solution using the popular and flexible Time Matters® case management system. Time Matters® has an intuitive row and column approach, allowing you to filter, sort, and search on any combination of information collected. The data entry screens flow from right to left in logical sequence. Your staff will find the program easy to learn and essential to your organizational success. 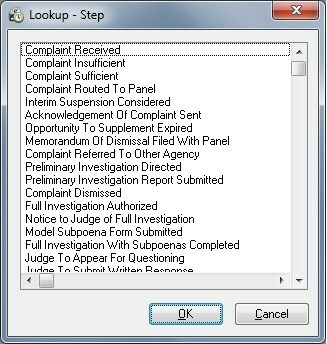 This screen shot of the Case Form for complaints demonstrates the flexibility and comprehensiveness of this solution. Each case form includes over 150 data elements that may be customized to collect the information you need for your agency. This solution is dynamic, it evolves as your state changes the rules, adds responsibilities, or alters the nomenclature of disciplinary enforcement. The date section provides the age of pending cases and the number of days at closing for closed cases. This solution has been designed with your end of year statistical reporting requirements in mind. Here is a brief description of some of the fields on the above screen. Case Name: Free text according to your practice. Case Number: Automatically incremented internal case number. Level: The subentity currently responible for the case. Staff: The person in your office assigned to this case. The sections for Respondent, Respondents’ Counsel and Complainant provide for label printing and mail merge production of your notices and other forms. Below is a sample for your mail merge documents, organized by the stages of processing. As part of the implementation package we will setup 10 of your most commonly used letters, and then teach you how to maintain your own merge templates. In addition to tracking each case, this solution includes a contact level database, so that an Attorney or Judge is entered only one time and then is linked to each complaint. Likewise, complainants, counsel for the respondent, court reporters, panel members, investigators, court personnel and other actors in the process are added only one time to the contact database and then linked to each complaint. This solution also includes linking each case and contact to all the documents, scanned responses, notes, emails, telephone calls, interviews and other calendar entries as well as a chain of tasks associated with predictable case processing steps. A view of all the complaints filed by a particular complainant, and all cases represented by a particular counsel is standard to the program. This solution has a data import module to import all your existing cases, contacts and calendar entries. LexisNexis® is a registered trademark of Reed Elsevier Properties Inc., used under license. Time Matters® and PCLaw® are registered trademarks and Billing Matters™ is a trademark of LexisNexis®, a division of Reed Elsevier, Inc. All rights reserved.